Just a few days before we leave and so as you might expect the trip and the challenge ahead is never far from my thoughts. I feel good about the preparations and training I’ve done – my fitness is better than it’s been for many years and my weight is significantly lower than a year ago. I’ve also obsessively read and research anything I can find on climbing Kilimanjaro, trekking gear, hiking skills and high altitude physiology /medicine. I’m both exited (like a kid waiting for Christmas type excited) yet wondering what lies ahead. I know it’s likely to be tough in places and it’s the personal challenge to see what I can do that played a part in my first thinking about “doing Kili”. 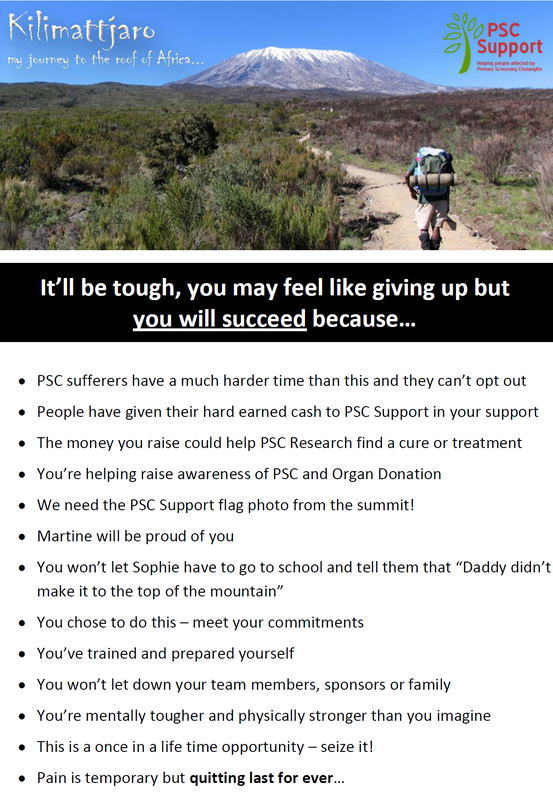 The other aspect of my Kilimanajaro challenge was of course to raise funds and awareness for PSC Support. I’ve been delighted, amazed and humbled at people’s good will and generous donations – so much that I have had to rise the fund raising target couple of times. Jeff in our team has also been fund raising too and between us we’ve already raised in excess of £6,000 which is absolutely fantastic. Thanks to everyone who has helped make that happen. Of course if you’ve not yet donated there’s still time to help and every single penny will go to good use to help those affected by PSC. Meeting my half of the sponsorship bargain will be a significant point of motivation when I’m on the mountain. To help reinforce my commitment and in an attempt of some amateur psychology I’ve produced a Motivation Letter to myself to remind me why I’m doing this and who’s supporting me. I’ll be taking a laminated copy with me in my back pack and plan to read it daily. So if you’ve sponsored the climb you’re going to the summit with me both in my grateful thoughts and on my motivation sheet. I’ll produce a final one on Thursday night before as I pack so why not get you name on there by sponsoring me? This week’s main challenge will be how on earth do I pack all my gear and keep within my weight limits for the airline and mountain porters? I’ll write up a separate blog on my Kili Kit list and packing – it’ll be interesting to see what I actually find useful vs all the stuff I’d like to take. Categories: Kilimanjaro, PSC, Thoughts | Permalink. Best of luck. I look forward to absorbing your wisdom when you come back!